Capture the reason for the Thanksgiving season with help from these charming and heartwarming placemats. 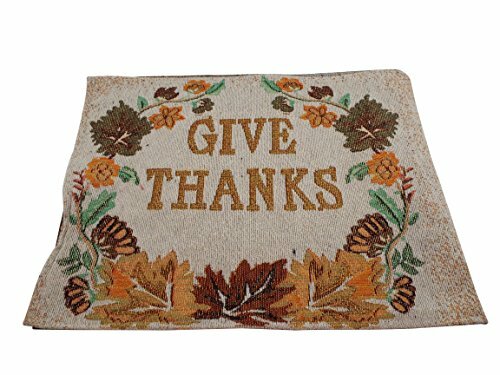 The gold "Give Thanks" message is encircled in a wreath of fall foliage in shades of brown, gold, green and rust. Gold thread throughout lends a sparkle to the scene. Each of the tapestry placemats measures 13 inches x 19 inches. Cream with warm colors of green, brown, rush and gold. If you have any questions about this product by Home Concepts, contact us by completing and submitting the form below. If you are looking for a specif part number, please include it with your message.